I don’t believe I’ve ever read any books by Richard Deming (1915-1983), but I understand that he was born in Des Moines, Iowa, and educated in Missouri. He’s also said to have once served as a U.S. Army captain, a social worker, and an employee of the American Red Cross, and was apparently a member of the Mystery Writers of America’s board of directors for the last six years of his life. 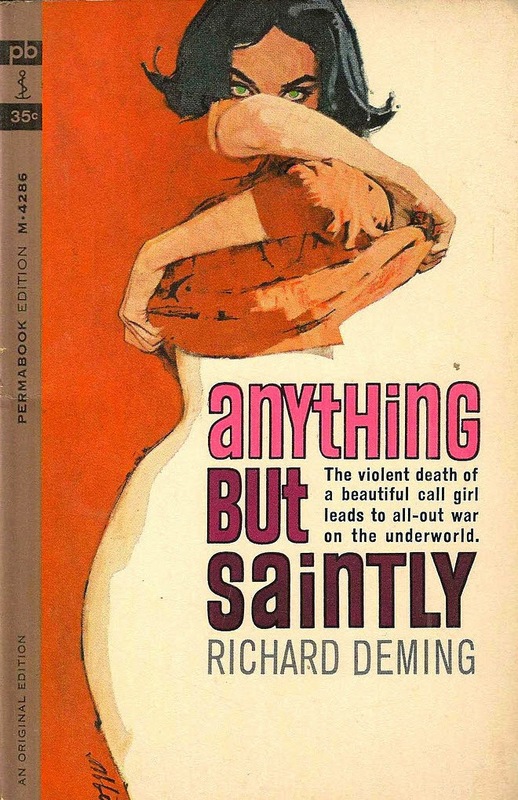 According to the fine blog Vintage Paperback Reads, “Richard Deming had a long career that ran from the ’40s to the ’80s. He wrote many short stories, novels, and film/television adaptations. Highly admired, he created characters such as Manville Moon [and] Matt Rudd, and took over the Tim Corrigan series under [the house name] Ellery Queen.” He wrote under a wide variety of pseudonyms, including Max Franklin, Halsey Clark, and Nick Morino. Deming didn’t lack for energy when he sat down in front of a typewriter. He’s credited with having published more than 70 books, including 10 under the Queen name and 11 works of non-fiction. In addition to composing stories featuring his own characters--such as Edge of the Law (1960), Hit and Run (1960, starring Buffalo, New York, private eye Barry Calhoun), Body for Sale (1962), and Death of a Pusher (1964)--Deming also penned more than 20 TV tie-in novels (often under the Max Franklin pseudonym) using the characters popular from Dragnet, Starsky & Hutch, Charlie’s Angels, and The Mod Squad. Concealed behind the house name Franklin W. Dixon, he’s even said to have written an installment of the Hardy Boys series, The Vanishing Thieves (1980). And on top of all of this, Deming reportedly composed more than 100 mystery and detective short stories, one of those being “The New Hand,” which appeared in the November 1968 edition of Mike Shayne Mystery Magazine. As a town, St. Cecelia was anything but saintly. She was rife with prostitution, dope, gambling, the works. Matt Rudd of the Vice Squad had the lurid inside story, but he was helpless as long as crooked politicos like Nick Bartkowiak and his right-hand goon, Little Artie Nowak, kept the Police Commissioner under their thumb. The strangling of one of Little Artie’s call girls raised a few eyebrows, especially Rudd’s. When his questions brought him face-to-face with a gun, a five-gallon bucket and a sack of plaster-of-Paris, even the cowering Commissioner had to face facts. It was shoot to kill, all-out war on the underworld! That sounds promising. Unfortunately, I don’t own a copy of Anything But Saintly. But someday maybe, because I’ve been appreciating its cover for a good long while. 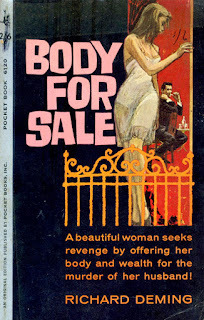 It’s the work of Indiana-born paperback artist Robert K. Abbett. Although he’s now 82 years old and specializing in dog, sporting, and wildlife paintings, during the 1950s and ’60s Abbett produced jacket illustrations for Permabooks, Ballantine, Pyramid, Ace, and a number of other paperback publishers. His efforts graced books by A.A. Fair (aka Erle Stanley Gardner), Graham Greene, Jack Webb, and Wade Miller. A small gallery of his paperback work can be studied here. What’s most captivating about Abbett’s illustration for Anything But Saintly, of course, is how much it leaves to the imagination. While this artist could capture a near-naked woman with a sensualist’s enthusiasm, he chooses here to offer only the suggestion of a shapely hip and a tantalizingly exposed midriff; our previous knowledge of the human form and our natural desires must fill in the rest of the picture. 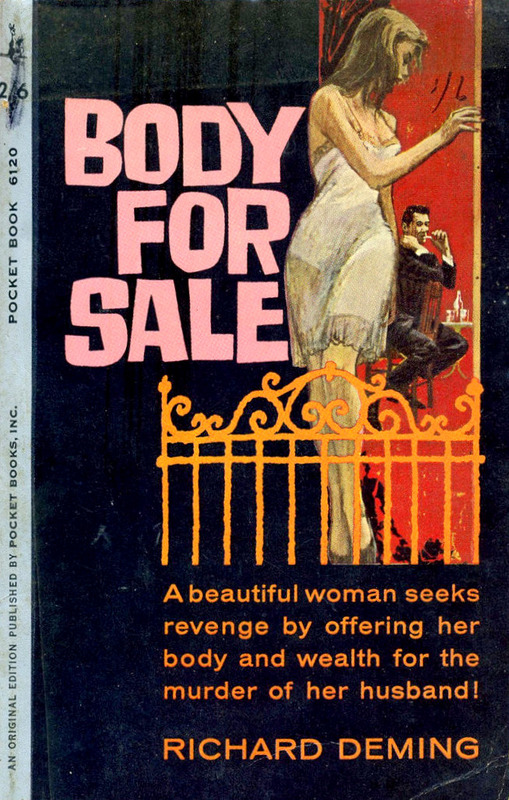 The balance of Abbett’s art with the book’s title is also neatly accomplished, though our attention may be more drawn to the woman’s penetrating gaze. Indeed, even a saint would have trouble turning away from those eyes. Yeah! Great post, so informative, and so much fun to read. And you're right on about the cover and its suggestiveness, and how much is left up to the imagination. I'll certainly keep my eyes open for this.